The Best Part Of The RV Community Is The Willingness To Help Each Other Out With Information And Advice! Regardless of if your camping in a travel trailer, fifth wheel, motorhome, schoolie, teardrop of truck camper- there are people on the road who understand your pain points and have useful tips on how to deal with them! RVers love to help each other by providing information, inspiration and general ideas, and the best place to find the answers to your questions is likely Facebook! Facebook has grown tremendously over the past many years and includes amazing resources for people who have unique perspectives and similar interests to come together to share advice and encouragement. What used to be just a way to keep up with family and folks you went to high school with, is now a full blown community of social sharing valuable information. On the Live Camp Work Business Page, I share general RV information, links to my blogs, and share awesome RV content I find across the web. I also announce major publications, like the launch of new products and services, as well as my involvement in upcoming RV events like the Workamper Rendezvous! Inside the Live Camp Work Facebook Group, I share a more personal side. I post questions, start discussions on Live Camp Work topics, share additional RV resources that members will find helpful, chit chat back and forth about RV topics, personal experiences and much more. I invite you to join the group if you’re not already a member and start conversations of your own! Ask your burning questions and provide feedback to those who seek your advice! I’m a member of several other groups on Facebook, which all have great benefits as well. So depending on the content and level of integration you’re comfortable with you may enjoy being a member of the following additional Facebook Groups! 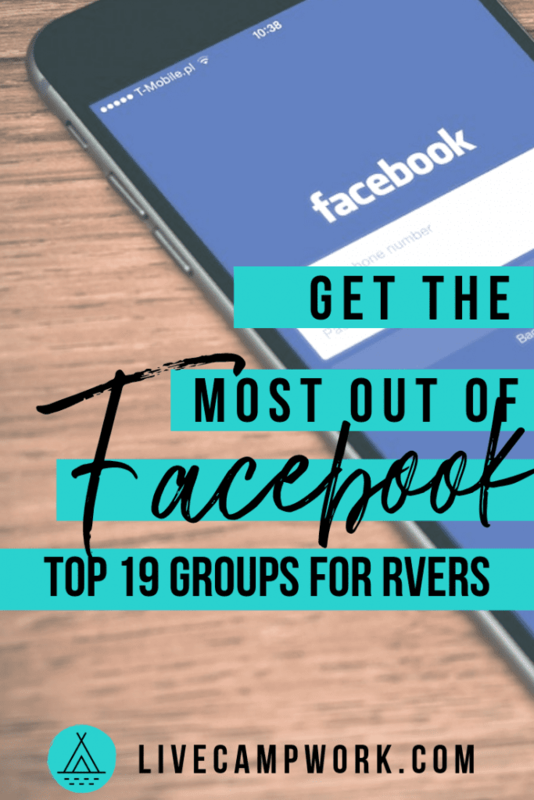 19 Awesome Facebook Groups RVers Will Enjoy! RV Newbies: This is an RV group based in the United States where the questions and answers will reflect Us travelers. 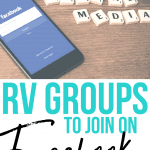 This group is for those who are new to RV’ing as well as seasoned RV’ers. North American RV Travel: Share your stories, reviews, and blogs in this RV group for North American travel! You are free to share (and link to) your RV Related blog posts and YouTube Channels here. RV Cheapies: An RV group to share all free or near free RV stops, destinations and places to park and things to do along your trip. Great resource for freebies while traveling! Full-time RV Family Life: A positive place for all full time, future full time, or those looking for info about the full time RV lifestyle. The vision of this group is to share, inspire and grow together. Women Entrepreneurs Who RV: This group is for women entrepreneurs who RV. Women who love to travel (any travel), single or married, full-time and part-time, or just dreaming about being an entrepreneur and traveling will find great inspiration and information here. Full-Time RV Bloggers & Business Owners:This group was created for Full-Timers who blog/own their own business online as well as those who want to! Get advice, tips and come connect with other travel bloggers! Workampers: This Workamper RV group is for discussing workamping jobs, seasonal, and/or remote opportunities with onsite employment for RVers. The RV Entrepreneur: The purpose of this group is to be a resource for learning how to build an income while traveling full-time… before retirement! RVing Rocks: What started out as a fun family camping activity has become a group of over 7000 members, hiding rocks everywhere from campgrounds to stores to their neighbors front porch. Fabulous RVing Women: ?in this RV group you’ll learn about the world of RVing together and establish FABULOUS new friendships as you travel. They share advice, pictures, and experiences that pertain to RV travel. RV Tips: This group is all about helping out fellow RVers. There is no political or religious posting allowed, this is an RV group for tips and general advice. The Virtual Campground: A fun RV group based off of the humor, products and service offered by Liz Wilcox of the Virtual Campground. Get to know Liz and have fun RVing… it’s that easy! Full-Time RVers: This group is designed to share your knowledge, information and experiences with other Full-time RVers and those who wish to become Full-Time RVers. You are free to post pictures, links, or anything you want to share with the group as long as it is RV related! Fulltime Families: This group is sponsored by Fulltime Families, a company that connects and supports traveling families by providing education, support, discounts, and community. Join to connect with fellow RVing families! Winter RVing – Let’s Stay Warm Together: For RVers who want to RV in the snow or cold weather in general! This is our place to discuss heat, insulation, propane, snow, ice, and the ins and outs of winter RVing with like-minded folks. Workamping Families: This group was created to assist families (with children) in finding workamping jobs on the road. Friendly RV/Camping Women: A group of self-proclaimed ‘friendly and kind women’ who share the same passions to travel the open road, explore new places and meet new smiling faces. Thousand Trails (Outdoor World) & Encore — The Good AND The Bad: It’s an online campfire where you can hear both sides of the story relating to Thousand Trails Membership. Amazon Camperforce Community: This group is for past and present Amazon Camperforce workers and RV’ers who are interested in working at Amazon. All are welcome here to share information and keep in touch, both during the peak season and afterward. 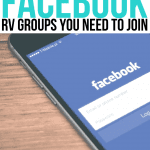 Okay, so those are my favorite RV Facebook groups! I encourage you to find the ones that are best suited for your life and your interests and add something of value! Request to join, introduce yourself and join the conversation! There’s really not much you can do wrong in a Facebook group as long as you reach and abide by the group rules, which are pre-set for a reason! Have fun and connect with tribes of people who get it!